Dryopteris carthusiana. plants. © Les Mehrhoff, 2008-2010. discoverlife.org (Accessed 4/2017). 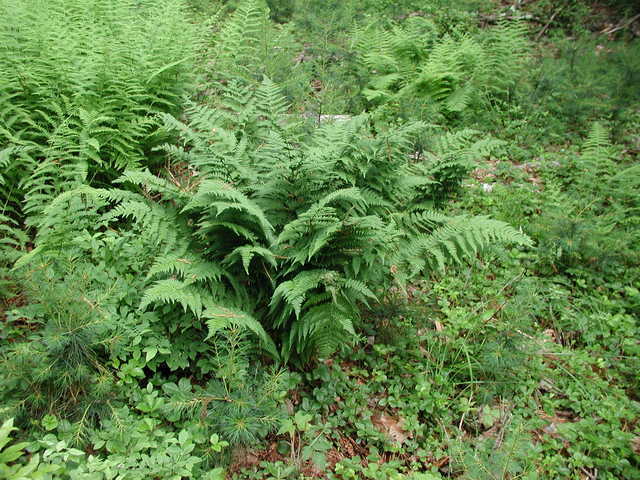 Dryopteris carthusiana is a fern from a short rhizome. Leaves evergreen, in a rosette; stalk 1/4 – 1/3 as long as blade, green with pale brown, membranous scales, blades about 50 cm long, 25 cm wide, widest slightly below middle, twice pinnate and pinnately lobed to three times pinnate; tip pinnately lobed, primary leaflets 10-15 per side, pinnately compound, sides unequal, the basal secondary leaflet below the midrib is significantly longer than the secondary leaflet above the midrib, or the one next to it, the secondary leaflets are pinnately compound or deeply lobed, ultimate lobe margins divided or toothed, teeth minutely bristle-tipped (spinulose). Dryopteris carthusiana pinnule, sori.© David Fenwick 2014.05-08-10.aphotoflora.com (Accessed 12/2016). Spore cases midway between midvein and margin of minor leaflets leaf life span 54 weeks. Habitat: Moist woods, swamp forests. Notes: Shade tolerant, requires at least 0.2% sunlight in order to survive (compensation point), but cannot use more than 2.5% full sunlight (saturation point) (Hicks and Chabot 1985). 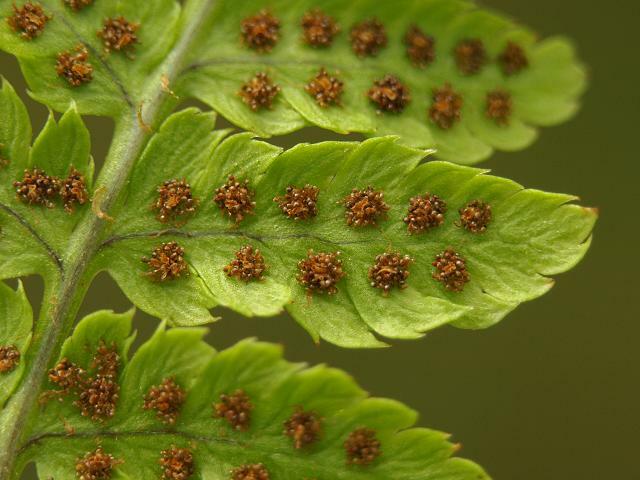 A host of the white-spored fir rust fungi: Milesina fructuosa, M. marginalis, and Uredinopsis atkinsonii (fir-fern rusts, Basidiomycotina) (Sinclair et al. 1987).